The only similarity between Kindersley Saskatchewan and Kelowna British Columbia is that they both start with a “K”. Meet Forrest “Bush” Halpenny, retired cop. He’s been around cars his whole life. His parents were partners in a Volkswagen and Rambler dealership back in Saskatchewan. His first car was a ‘56 Chevy, 2 door post, but he always wanted a Mustang. His policing career had taken Bush and his family to the Vancouver area. He had planned retirement for 2002 so figured he’d have the time to tinker with a toy car. 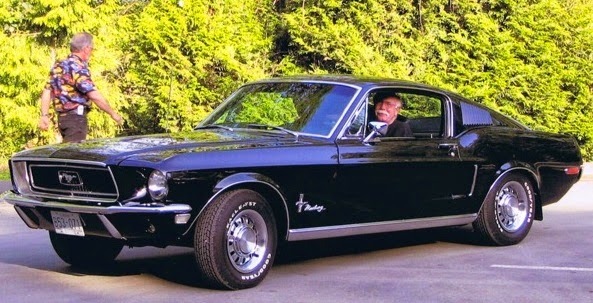 In November of 2002, he found the ’68 2 +2 Fastback in Abbotsford, a 289 V8 with automatic transmission. It was exactly what he’d been looking for. The Mustang had the usual squeaks and oil leaks. Bush did what he could on his own with help and advice from members of the Greater Vancouver Mustang Association. In 2003, he was at a car show at the Mission Raceway and was approached by a guy who said the car was his. Bush asked him how he knew that. The guy said when he originally restored the car in the early ‘80’s, he had welded the top shock bracket but had not smoothed it by grinding. They checked and sure enough it was his old car. It came from the Ford factory in San Jose California, painted Wimbledon White, not the black beauty you see today. 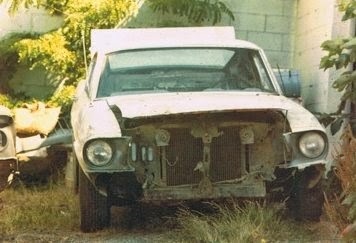 The guy was able to provide a photo of the car as he found it in a back alley in Vancouver. The car had been completely taken apart and repaired like only the owner of a body shop could do. In 2005, Bush and his wife Gladys moved to the Okanagan where they met Mark and Carol Oakley and formed the Okanagan Mustangs and Fords Association. 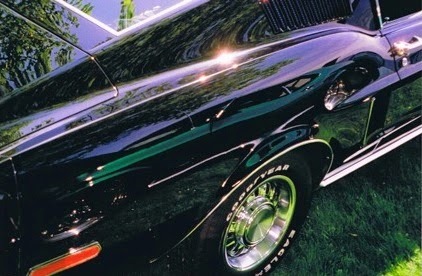 In 2009, the ‘68 was taken to Randy MacMurphy, owner of MACAW Autobody in Kelowna for a repaint. There the car was stripped to the metal. 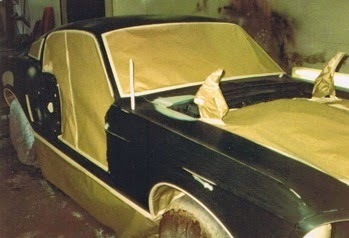 Any remaining body work was done and the black paint you see today was applied. Gladys Halpenny calls the car the “chick magnet”. Good luck with that Bush!